All 5 Core Modules to learn how to launch, grow and profit from your own ‘storytelling interview' podcast. Bonus: Podcast Technology Report, all the best podcasting technology and tools in one report so you never have to figure out tech yourself. Bonus: Rapid Podcast Launch Guide, a step-by-step with pictures beginners guide to setup your podcast for the first time. Bonus: Interview Questions Cheatsheet, a 26 question handout detailing the questions Yaro asks guests on podcasts, so you're never stuck wondering what to say next. All 5 Core Money Finder Modules to learn how to research and identify your ‘sweet spot' topic to build your business around. The Profit Test training program, a step-by-step real life test you can conduct to validate if there is money to be made in a market. Bonus: Personality Profiler, a personality test and report to determine your online entrepreneur strengths and weaknesses. 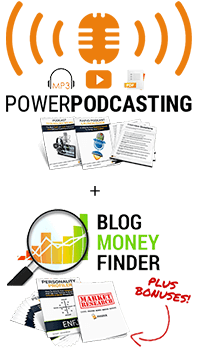 Bonus: Money Makers Report, breaking down 1,001 proven profitable topics so you don't have to guess where the money is online. All available as instant downloads in video, audio MP3 and text PDF transcripts inside the membership area immediately after purchase.